You’re a high school science teacher and your class is learning about dinosaurs. You can’t exactly run to the local dino bone barn and buy some bargain bones for them to see first-hand. But what if you had access to a 3D printer? Enter the American Museum of Natural History’s education department, which is experimenting with scanning and printing bones. 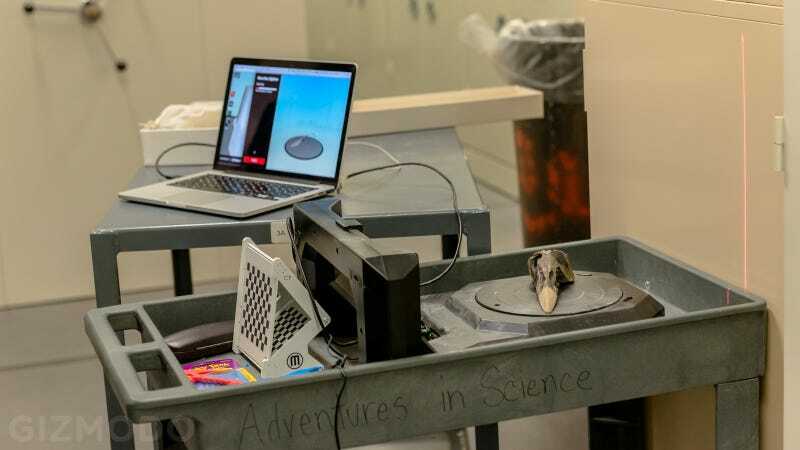 Over the summer, the AMNH hosted a camp called "Discovering Dinosaurs," where students were able to put together their own models using 3D-printed parts. And the museum hasn't stopped its exploration of 3D printing. Gizmodo recently paid a visit to the AMNH, where we spent a morning with Barry Joseph, the museum’s Associate Director for Digital Learning, Youth Initiatives. The AMNH is currently gearing up for a new pterosaur exhibit that will open to the public this spring. Pterosaurs are a group of winged reptiles, that are neither birds nor dinosaurs, that flew through our skies some 220 million years ago; they were around for 150 million years before they met extinction. (You probably know them as pterodactyls, although that name is technically incorrect). So what’s 3D printing have to do with this? Pterosaur bones don't exactly grow on trees. From creatures that could be as small as sparrows and as big as F-16 fighter jets in their time, pterosaur fossils are very rare. Connected by thin membranes, their brittle bones were more often than not smashed and not well preserved. The AMNH—which has in its collection upwards of three million fossil specimens—only has six cabinets of pterosaurs, amounting to around 12 specimens. An even smaller percentage of those are actually scannable. But if you can't find more, then why not just reproduce what you have? Several departments are collaborating at the museum in the name of 3D printing. For example, we shadowed Joseph, senior scientific assistant Carl Meling from the palaeontology department, and lab tech Morgan Hill from the imaging department as the carefully combed through those cabinets to decide which bones they wanted to 3D print. The process was tedious, but, ultimately, they were able to land on a few scannable examples. So what exactly is the criteria for a dino bone to be 3D printed? After nixing pancaked bones and crushed carcasses, Joseph landed on a near-pristine pterosaur skull and popped it in the MakerBot Digitizer. The process takes about 11 minutes, after which the scan can be converted into an .stl file. At some point in the spring, these files will be made available to anyone who wants them, educator or otherwise, and you won't even need a 3D printer to use them. Just want to look at some skulls in 3D on a screen? That's why the AMNH is scanning these bones, too. 3D printing and its growing suite of tools are opening up plenty of opportunities. “In the education department, thinking about maker culture and how it’s impacting informal learning in general, and specifically informal science learning—that is a new area for us," Joseph raved. "We’re an object-based museum as a natural history museum. The idea of getting to manipulate things and construct them in a creative way is good for teaching phenomena and to educate the populace. We can use them in a way that helps people connect with objects, learn how to look at them, learn how to care about and understand their origins, and learn what scientists have done to collect them and present them in the museum,” Joseph explained. 2013 has been a banner year for 3D printing at the museum, too. The AMNH just got its Replicator 2 last January, and it’s been something of a trial and error process ever since. They’re still figuring it out, but it’s promising, and perhaps a sign of the times that it’s not just the AMNH using digital fabrication. Joseph told us of his museum cohorts in the city: "The Met did a program where young people scanned sculptures and then mashed them up and printed them out. The Brooklyn Museum of Art had a program for people with limited vision. They could actually touch the objects by having things that were printed. MoMA did something. None of us were doing this stuff a year or two ago, it’s all new. We’re part of 2013, a year of use-cases, exploring of how digital fabrication can be used to teach art, to teach a museum, to teach science." Within this conversation of scanning pterosaur bones, Joseph listed off a number of other ways in which the museum is already using or plans to use 3D printing. For example, the pterosaur scans will also be used by kids in an after-school program called #scienceFTW later this spring. They'll be making their own augmented reality versions of the open-source card game "Phylo" that include these winged reptiles to show how they ate, hunted, flew, and so forth. The beautiful part of this is that it's all very open-ended. It's easy to get skeptical of 3D printing from time to time. Oh, you want to 3D-print another desk tchotchke? Good for you! Oh, another 3D-printed bottle opener. But education? That's something we can all get excited about.